On Sundays a lot more stuff is closed here than in the U.S. (unless you’re in an area with Blue Laws), and whether or not they attend church, people spend much of the day walking around. This Sunday I’m catching up with the blog, but a week ago Richard and I explored the historic Alfama district. 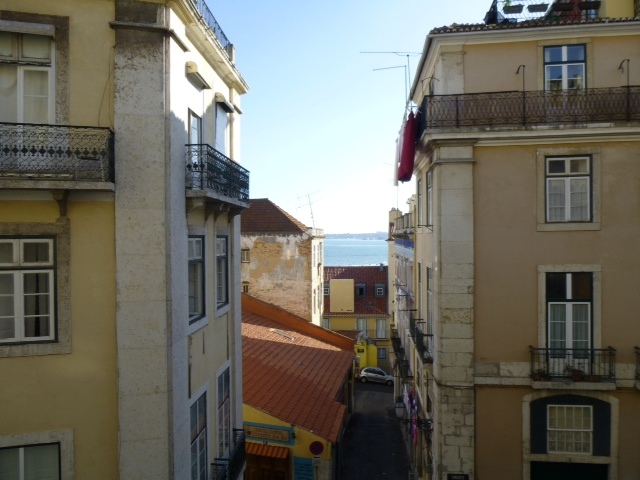 Along the waterfront, it was the first area of Lisbon to be settled, and today it features many of the restaurants and clubs where one can hear the traditional Portuguese music called fado. 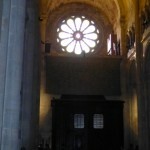 Also in Alfama is the oldest standing church in Lisbon, dating from the 12th century. 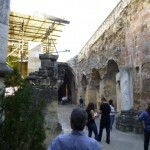 The church is built on top of ruins of Roman and Moorish buildings, including an early mosque from the 9th century. 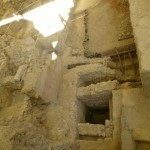 These are in the process of being excavated. The Roman building is made of bricks, while the Moorish building has smooth walls. This church at the edge of Alfama is built over a synagogue destroyed during the Inquisition. Portugal, like Spain, carried out the Inquisition against Muslims and Jews. Non-Christians were given the choice to convert, get out, or die. Most of the Muslims fled to North Africa. Most Jews converted. In fact, I’ve read that one-quarter of Latinos and Latin Americans of Spanish or Portuguese descent have Jewish blood, since conversos were more likely to settle in the Americas in the (often false) hope that the Inquisition would not follow them or would be enforced less strictly. The Inquisition officially ended at the beginning of the 19th century, and shortly afterward some Jews returned to Portugal from Morocco and other places in North Africal. At first they worshipped in private houses. 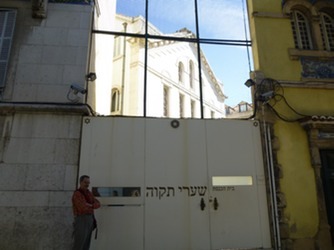 In 1897, the members of Lisbon’s Jewish community decided to build a synagogue, and Shaaray Tikva was completed in 1904. The congregation is Orthodox, and the synagogue is designed in the Sephardic style, with the bima in the center. In keeping with Orthodox doctrine, women and men sit separately, with women in the balcony. The synagogue is behind a high wall and not visible from the street. 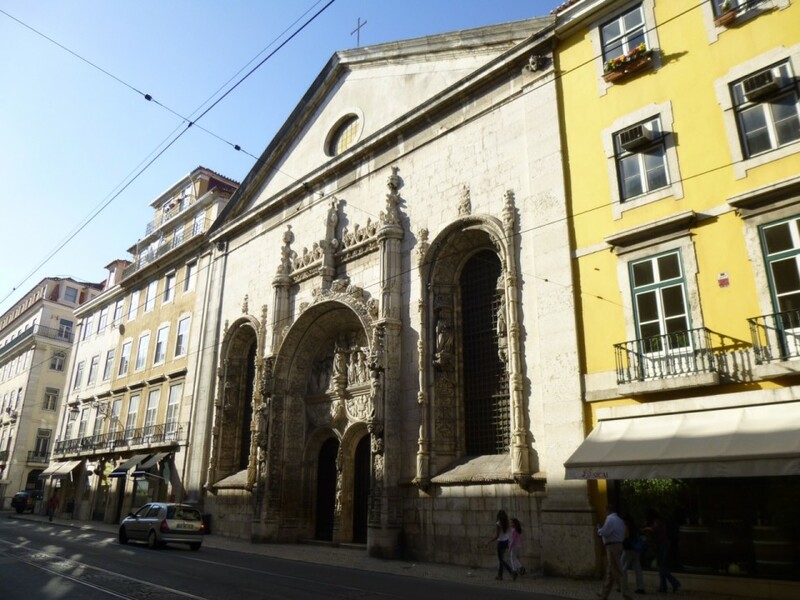 When it was built, Portuguese laws from the time of the Inquisition prevented any non-Catholic house of worship from facing the street. The synagogue, however, is steps from the Rato metro station that serves our neighborhood, so I see the wall all the time and hopefully will get a chance to tour the building. So far, this is the closest I’ve gotten.